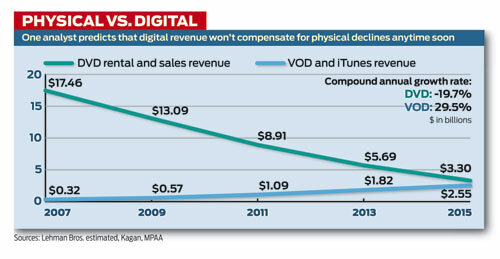 Are Digital Profits Enough to Compensate for Eroding Physical Media Profits? "Content may no longer be king in the entertainment business, as distribution giants Apple and Google seem to prove again and again..."
"The digital opportunity appears either too small or too distant to matter at present," Nathanson said in a report this year. Is "a la carte" Cable a Bad Idea? ...those fewer channels would inevitably cost a lot more (if they were still available at all) because a la carte pricing for channels reduces demand for individual channels, resulting in higher (not lower) prices per channel. Jeff Eisenach and Adam Thierer have put together a short report looking at the problems of a la carte cable, and noting that even if the intentions of those supporting mandatory a la carte cable are strong, the end result isn't likely to be what they'd expect. An End to the Internet by 2012? "Cloud Computing" or "Miasma Computing?" An interesting discussion by Nicholas Carr of the vulnerability of remote computing and storage, typically referred to as "cloud computing:"
The metaphor of "the cloud" is a seductive one, but it's also dangerous. It not only suggests that our new utility-computing system is detached from the physical (and political) realities of our planet, but it also lends to that system an empyrean glow. The metaphor sustains and extends the old idealistic belief in "cyberspace" as a separate, more perfect realm in which the boundaries and constraints of the real world are erased. "Pullmylink.com and sites like it are a one-stop shop for copyright infringement," said John Malcolm, MPAA EVP and director of worldwide anti-piracy operations. "We have filed several other similar suits and will continue to do so in order to hold operators accountable for their illegal activity." The MPAA has also filed suit against PeekVid.com, YouTVPC.com, ShowStash.com, CinemaTube.net, SSUpload.com and VideoHybrid.com. Instead of using the web to get films to people, studios ... use the web mostly as a medium to show dross, and just a handful of decent films. Yet, if the studios hope that by ignoring the web, Tinseltown can put off change, they are surely wrong (see article). Hollywood needs to confront the web—by embracing it. TO SEE what the future of film distribution might look like, go to a website called ZML.com. It offers 1,700 films for download to personal computers, iPods or other hand-held devices, or to burn to DVD. It is inviting and easy to use, with detailed descriptions of each movie, editors' picks, customer reviews and screen stills. And the prices are reasonable: “Atonement”, for instance, costs $2.99. There is one small catch: ZML.com is a pirate site. Hollywood's movie studios, which are used to dealing with scruffier crews like Pirate Bay, a Swedish outfit, are aghast at how professional the newcomer is. “It looks like a fabulous legal website,” says one studio executive. Special thanks to Steve Diamond's Valleywood for the article about the above articles! Why Content is Sliding to "Free"
It's true that people still consume media the old-fashioned way – but fewer and fewer do so every day. Most of the content industries are seeing flat or declining revenues and audiences. And these trends are particularly notable among younger people. As a result, the music industry is a shambles; the film and television businesses are running scared; and newspapers are disappearing or instituting cutbacks and layoffs. The handwriting is on the wall, or the laptop screen. ...this week two executives have left major Web companies for roles in the music industry. Wow. This is a really great "big picture" article about how the rapid rise of "cloud" computing. It's quite a remarkable shift, making all computers as well as media devices more like a network "terminal" rather than a stand alone device. This transforms the concept of "software" "privacy," "advertising," as all software, personal information and media content shifts away from our stand alone computers to the "cloud" of internet servers. Whoever controls those servers controls the data flow and much more. I'd quote the entire article, but please read it yourself from the link below. The gorilla in this nascent market is Google. It has been spending billions of dollars to build huge data centers, or "server farms," around the world, enabling it to run all sorts of consumer software and store enormous quantities of personal data. Combine that processing muscle with the company's dominance of web searching and advertising, and you have a juggernaut capable of redefining the software business on the media model. ...huge server farms are not only transforming the software industry. They pose big and growing competitive threats to many traditional publishing, broadcasting and advertising firms. The media business has already gone through wrenching changes thanks to the web, but the upheaval is just in its early stages. There are dark sides to the blurring of media and software. As companies become more adept at tracking the activities and preferences of people, the temptation to monitor and even manipulate personal behavior will grow ever stronger. We are also likely to see a continuing fragmentation of media and audiences, as sophisticated software algorithms are used to create custom bundles of content geared to individual preferences. Google has said it wants to store "100% of a user's data" inside its data centers, enabling it to achieve what it calls "transparent personalization." At that point, the company would be able to automatically choose which information to show you, and which to withhold, without having to wait for you to ask. "...a panel of wireless and advertising executives agreed Thursday that the industry is still far from delivering on the promise of cell phones as mini-media players." "Neither the quality or quantity of content or the business models are in place yet to generate the audience growth necessary to make mobile media viable, according to industry players convened at the Media Summit to discuss the "Mobile Platform 2.0."" "“Of course a panel on online music-business models was going to degenerate into a food fight,” wrote Joseph Weisenthal of paidContent.org." "Broadband will be the primary source of entertainment," he says. "Users will now be connected to a virtually unlimited combination of services, offers, devices and content. The services will spread the gamut; a feature of media players, social networks, recommendation engines, online affinity groups, retailers or brand marketers. Media can be consumed in download purchases, conditional downloads (rentals), on demand or linear streaming (online radio and TV)." "Digital Media 2.0 is ushering in an era of unprecedented choice for the consumer and the savvy content producer. In this world premium content and user content has increasingly merged, and is tailored to the consumer’s preference in service, offer and device. Now, where you are, the device you have, or the site you’re on, slowly but surely cease to matter. We’re left with a consumer that can listen to what they want, where they want, no longer hindered by choices about formats and rules. Instead they are fueled by friends' influence, recommendation engines, editorial, radio, etc… that will alter use radically. Finally the user and the entertainment industry end up aligned on the only thing that matters: the music, shows, and films." Nine Inch Nails & Radiohead-- Beacons of the Future of Creative Profit? "Nine Inch Nails' surprise release of Ghosts I-IV today in five differently priced formats is the perfect example of how recorded music can, should, and inevitably will be sold in a world where free has become the norm." ... the $300 deluxe box set is sold out, according to the Nine Inch Nails Web site. The band made only 2,500 copies of the deluxe set, which means that they've already grossed $750,000. In preorders. In less than a day." "All albums, whether sold as MP3 or CD, however they're distributed, end up on P2P networks. Those who claim Radiohead and Nine Inch Nails' strategies lost them money have lost the plot. If Amazon's MP3 chart (below) is any indication, Reznor and Radiohead are both doing quite well sales-wise, despite their unconventional record release strategies." Here's a new term: crowdfunding. [Crowdfunding]..."is used widely among music industry artists to bypass music publishing companies and "go direct" to their fans who are now seen as much as investors as listeners." "...fan-funded music is a concrete example of [reinventing the the music industry], replacing two components of the standard record label: A&R (finding artists) and the financing of albums." IBM's 1 Second Movie Downloads, etc. Here's a real stunner: Forget Blu-ray or the recently demised HD DVD format. IBM on Friday said it's working on high-speed networking technology that could let consumers download a high-definition movie off the Internet in less than a second. From the Hollywood Reporter, studies indicate cellphone music to consolidate. It says that "digital music generated $2.9 billion in 2207, a 40% jump from 2006." Also it notes that "iTunes is outperformed by mobile music operators in Japan:"
"Digital audio — first illegal and now legal — has permanently changed how people find, buy, and listen to music. The new music industry economics will bring in $4.8 billion in revenue from digital downloads in the US in 2012, yet even the 23% compound annual growth rate (CAGR) from now until then will not compensate the industry for its losses." Digital Change Articles -CES 2008 etc. "What united a content company (NBC Uni), a major ISP (AT&T) and a software creator (Microsoft) in one room was the frank assessment that all are on losing ground as infringement continues to grow, particularly on peer-to-peer networks." "The participants acknowledged that their collaboration was unlikely given the turf battles of previous years, when legal imperatives dictated that each party protect its own interests. That has given way to a collective awareness beyond Hollywood that the various industries have to work together." (Comcast announced) ..."an expansion of the cable giant's free HD VOD (video on demand) offerings, which includes TV, film and music videos. The HD library, part of a greater catalog of 10,000 titles, will grow from the current 300 to over 1,000 in 2008. Comcast hopes to ramp up to 6,000 films in 2009, 3,000 of which will be in HD." "These projects are part of a Comcast initiative dubbed "Project Infinity." The goal of the strategy is to provide a limitless library of content for consumers on any screen." Their site they are building up is called Fancast. All the music companies are doing away with digital rights restrictions on downloaded music sales in an effort to steer power away from Apple and make digital music purchasing more appealing to consumers. Songs can now be played on any player, iPods included. "...empowered consumers with an unlimited supply of music directly contradicts the old industry basis of enforced scarcity. The trick is figuring out how to monetize what consumers are already doing. Unfortunately, there are no jaw-droppingly obvious or brilliant solutions at hand, although he and Nettwerk Music Group CEO Terry McBride seemed to lean toward some sort of blanket license applied on ISP fees." "consumers continue to find ways to bypass DRM (digital rights management) and emerging revenue models to download and share music, making it not just impossible for the music industry to make money from traditional means, but also difficult to make money at all. In the meantime, artists have embarked on their own revolution, using social-networking sites and other online means to get their music directly in the hands of fans and finding other ways to derive revenue from their work." "This is about the consumer, about monetizing their behavior and giving them choice. For all of the people that believe in controlling the IP and how [the music] gets to consumers, the game is over. It was over seven or eight years ago, and soon your business will be over." "Goldring suggested the industry focus on business models built solely around the networks that allow users to download music and find ways for everyone involved to make money that way." "Ownership is a generational thing," he said. "Even though kids today are buying from iTunes, I don't think they care about owning a thing. As they become the new generation of homeowners and bill payers, [music subscription] will be moving toward a cable [TV] model." "Over the past year, Netflix has utilized technology that allows its subscribers to watch more than 6,000 movie and TV titles on their PCs, echoing the strategy that many other content distributors have pursued to take advantage of growing consumer interest in watching entertainment content online." "Now, in conjunction with South Korea-based LG, Netflix plans to allow its more than 7 million customers to download entertainment titles straight to their TV sets from the Internet, a shift likely to be welcomed by people who prefer to watch movies on their HD sets."